Captain John Christopher "Topknot" Roberts was once a simple ship's cooper and has spent most of his life at sea. As a young man he was captured by barbary pirates off the coast of Turkey. Having no family to ransom him, he avoided being thrown overboard by offering his services to his captors. He adapted his signature hairstyle as a result of his captivity by the barbaries. Eventually (and quite by accident), Topknot was freed by his cousin, none other than the notorious pirate Bartholomew "Black Bart" Roberts. Topnot and Bart sailed together for a time, but eventually the more relaxed Topknot grew weary of strict Bart's teetotalling ways and asked his cousin to grant him a ship and crew of his own. His request granted, Topknot re-christened his ship Outrageous Fortune, a play both on Bart's flagship, the Royal Fortune, and his own father's love of Shakespeare. ​For reasons no one quite understands, Topknot was recently inducted into the most notorious Order of Leviathan. Quartermaster, Randy Rackham, first signed on a schuyt out of Altenholz Germany as jack o’ all trade. Poor fishing turned into piccary for coin till the Watergeuzen (Sea Beggers) fleet caught up with them in the North Sea. He avoided the noose narrowly as fate provided him with an opportunity to show his worth. En route to the Ottoman Empire a waterspout pulled the ship asunder. Lucky was Randy, for Una, a beautiful mermaid, pulled him from Davy Jones’s locker. She brought him to the isle of Pantelleria where his flesh and soul rejuvenated. Happenchance brought Outrageous Fortune to the island where Randy was “rescued”. 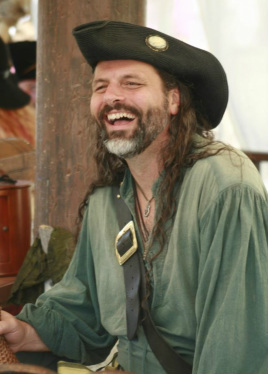 It wasn’t long before his lying around, drinking from coconuts, and spouting limericks impressed the crew and he was voted quartermaster. “LogKeep” (some say LogKeeper; no one knows his real name), was the Scout & Master Gunner O’ the one oar reconnaissance vessel “Blackend Rose”. He be a natural born explorer. Equally at home lurking in the shadows of a Pub or the backwaters of the bay (or cyber seas) by the new moon. This former agent/spy of the... Vatican?/Governor? (He’ll not say) learned the true value of information and turned to "Private Practice"
﻿ Offering up maps, secrets & schedules to the highest bidder the Loggkeep is hard to corner and nar impossible ta kill. The Cap’m wisely offered him a share, See’n as it be far better ta have this shadowy reporter look’n out fer the crew than look’n in fer the enemy!!! Ship's Surgeon, Robert "Blind Dog" Greystone III's skills as a physician are matched only by his prowess in battle. Despite being almost completely blind, he can amputate an arm or leg with quick precision, even if all that's wrong with you is a headcold cold or splinter. Rumors to the contrary aside, Blind Dog was in fact trained as a physician, having attended London's Queen Mary University and served with the King's Navy before his ultimate capture by the crew of Outrageous Fortune. Finding Topknot's command to be more to his liking, Blind Dog adapted quickly to life as a pirate. Known for his generous administration of rum and opium in emergency situations, he has even been known to occasionally give some to his patients. In combat, Blind Dog terrorizes his foes into submission by waving his sword wildly and spitting out his false teeth. 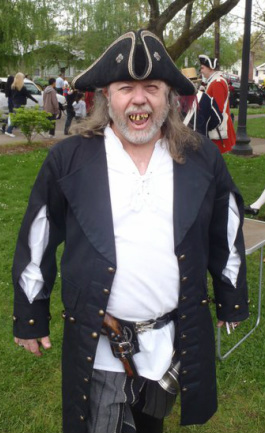 Master at Arms, Jacob "Sharktooth" Chase, was a merchant seaman with a British shipping company. On a spice run his ship was attacked by pirats and he was thrown overboard during the fray. While the rest of the crew was taken hostage, Sharktooth was forgotten in the water. As he foundered, he vowed to extract revenge upon the one who grinned at him from the deck as the ship sailed away. All he could make out was a rough pirate with scars consistent with a grapeshot blast. Sharktooth was picked up a day later by another merchant ship, at which time the ship's surgeon discovered upon Mr. Chase the wounds from an apparent shark attack. Chase recovered and upon his return to England immediately joined a crew bound for pirate infested waters. Once again his ship was attacked, and this time he was given the opportunity to join the pirate crew. Thus began his hunt for the pirate he later learned was known as Grapeshot the Large. Sharktooth made a name for himself with his ferocity and his modified teeth which he often used to remove his enemies. By luck Sharktooth finally found his nemesis and killed Grapeshot taking his place as Master at Arms with the Outrageous Fortune crew. 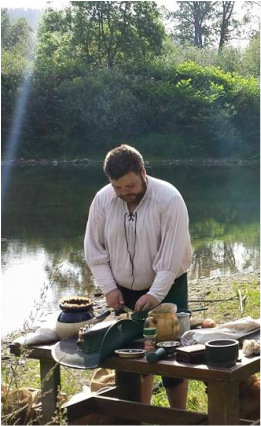 Acting Bosun, Gunwales. 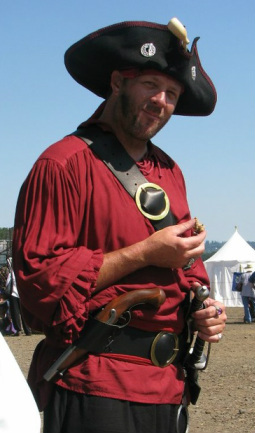 Gunwales' pirate career began as did most others. Under the guise of serving the Crown, he was already being groomed as a Maritime Salvage Consultant. Serving with the Honourable Artillery Company, he grew ever resentful of the corrupt officials and the totalitarian regime. A chance encounter with the crew of the Outrageous Fortune convinced Gunwales' that a rum-soaked, lazier future was indeed possible. 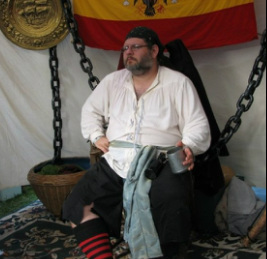 The crew was impressed with Gunwales' ability to go for days without eating (thus leaving more food for them), and, in light of bosun Joe Therogue's indefinite leave of absence, made him their Acting Bosun. Ships cook, “Tiny” Delgado. Many years ago, Tiny owned a small inn in the Azores called “Porco e Pá”. He took up with the Outrageous Fortune after a lively argument concerning what was meant by “too much garlic” forced him to give up the family business and seek a way off the island and away from the local constabulary. Tiny showed up to the dock with nothing but his trusty cleaver, thirty sausages, and the stench of desperation and pepper. Since he signed the articles the quality of fare on board has greatly improved. Crew deaths due to scurvy have been cut nearly in half, though crewmembers with nine or fewer fingers are much more common, what with new ABS’s regularly daring each other to pilfer a ships biscuit from the larder. The rat problem aboard the ship is being resolved as well; rumor is that Tiny has begun to actually clean the kitchen, though that may be purely hopeful speculation. Sail Master, Trubble. Strike colors trysail tackle bilged on her anchor long boat barkadeer keelhaul belay Corsair interloper topsail furl landlubber or just lubber loot black spot scourge of the seven seas warp Nelsons folly quarter killick bowsprit black jack fore Davy Jones' Locker run a rig mizzenmast loaded to the gunwalls coffer driver yard wench fluke hail-shot piracy lugsail Shiver me timbers topmast Admiral of the Black dance the hempen jig lateen sail flogging sloop scurvy Letter of Marque walk the plank Gold Road. 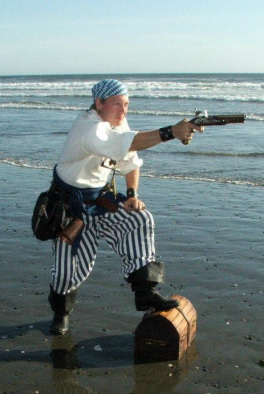 Black spot loot Corsair scurvy weigh anchor jury mast cable rope's end grog brig warp Barbary Coast swab avast spanker come about prow me maroon wench matey heave down grapple. Cabin Boy, Marie d'Aubigny, aka "Shanks" is allegedly the daughter of Julie d'Aubigny, or La Maupin, the infamous swordswoman and opera singer. Shortly after arriving in the New World in her late teens, she left her latest foster home in search of lucrative adventure. After a series of adventures in which she was given ample opportunity to demonstrate her prowess with both her knife and her feminine wiles, Shanks mistakenly boarded the Dread Ship Outrageous Fortune after a night of heavy drinking and found the crew to her liking. She served the captain and first mate more or less honorably as Cabin Boy for several years. At present she is recruiting new members in the Forsaken Northeast and has met with some success. However, at every opportunity she reports back to Topknot in person and raises a mug with her crew. Bosun (at large), Joe Therogue, is a bit of a mystery. No one (including himself) knows much about him. His earliest memory is of "rum and how I showed up on the deck one day without a memory". He is a gentle soul who abhors the thought of disciplining the crew, which is exactly why the crew gave him the job. His most frequent report to the captain is generally some variation of "The rum is gone again", or "Where do we keep the rum? ", or sometimes just, "Rum?". Bosun Joe is currently scouting potential rum suppliers in the American Colonies. He is expected to return when he remembers the way back.